Quebec City is a beautiful French Canadian city with a population of roughly half a million. As a UNESCO World Heritage treasure and one of the oldest cities in North America, this picturesque city is loved by locals and tourists alike. The fortified city walls and historic buildings of the city help Quebec feel more like Europe than North America, with the splendid Château Frontenac dominating the city skyline, and the Citadelle of Quebec housing the Governor General of Canada, and acting as the official residence of the Canadian Monarch. The city is also home to Basilique Cathedrale Notre-Dame-de-Quebec. Quebec City is the capital of Quebec and the center of a larger metropolitan area with a population of roughly 800,000. The city is located in the low-lying Saint Lawrence River valley, with the Laurentian Mountains situated to the north of the city. Quebec's location on the narrowing of the Saint Lawrence River gave the city its name, with Kébec being an Algonquin word meaning "where the river narrows." Quebec City is the second largest city in the province after Montreal and the seventh largest metropolitan area in Canada by population size. Close to the center of the city, on the St-Lawrence river, you can find Parc de la Chute-Montmorency, with its own Montmorency Falls, 30 meters higher than the Niagara Falls. The city is also close to Mont Ste-Anne, a ski resort in Quebec. As the provincial capital, Quebec City benefits from a wide range of administrative and services jobs. The provincial government is the largest employer in the city, with other jobs concentrated in the defense, commerce, transport, manufacturing, and tourism sectors. Laval University is located in the western end of the city, with the main campus of the Université du Québec also located in the city. The great majority of Quebec City residents are native French speakers, with 94.6 percent speaking French as their mother tongue and more than a third of residents speaking both French and English. Quebec City went through a number of municipal mergers in 2002 and reduced its boroughs from eight to six in 2009. The six boroughs or arrondissements are further divided into 35 districts or quartiers, each of which is numbered and most of which are named. A portion of the city and most of the Old Quebec area is located on a plateau known as the promontory of Quebec, with the low-lying Plains of Abraham located near the edge of the promontory. Quebec City is beautiful and has over 100 parks and gardens, including The Battlefields Park which offers amazing views of the St. Lawrence River. While Quebec City is not as busy as Toronto or Montreal, the culture of the city still manages to be vibrant and fun. The Winter Carnival is the world's largest winter festival, with the Summer Music Festival and Saint-Jean-Baptiste Day celebrations also attracting a large and diverse crowd. The tourism industry in Quebec City is very healthy, including attractions such as Montmorency Falls, the Basilica of Sainte-Anne-de-Beaupré, and the Ice Hotel. Mont Sainte-Anne is only 40km away, if you're looking to ski. Fine dining is a passion for some residents of Quebec City, and the Francophone nature of Quebec City also influenced the city's theater, music, and arts culture. The real estate market in Quebec City has been mostly flat for the last few years, with low population growth and a large inventory of homes for sale helping to keep prices from rising. While foreign buyers are starting to put added pressure on some sectors of the market, buyers are still in a great position to snap up great deals. Average property prices in Quebec City are relatively affordable compared to the bustling markets of Toronto and Vancouver, especially when it comes to condos. While the neighborhoods of Les Rivières and Sainte-Foy are in high demand, condo overbuilding over the last few years has led to healthy supply levels and attractive prices. This neighborhood has recently become trendy thanks to mostly-thoughtful development and extensive refurbishment. Once a working-class neighborhood, Saint-Roch now attracts a young bohemian crowd, thanks to its fashionable eateries, shops, and local breweries. Most of the action is within a block or two of St-Joseph Street, with real estate costs in the area rising, but still affordable. Also known as Old Quebec, this neighborhood features Haute-Ville or Upper Town, and Basse-Ville or Lower Town. The LGBTQ district of Quebec City resides in Haute-Ville, with this subsection of Old Town previously a religious and administrative center. If you're looking for cobblestone streets, street performers, and trendy restaurants, Basse Ville is the place to go. Château Frontenac is one of the area's major landmarks, with its beautiful fairytale perch sitting on top of the Cap Diamant promontory. While Parliament Hill is more subdued than places like Saint Roche and Vieux-Québec, it has more space and a greater variety of services than other parts of the inner-city. This neighborhood is just a few minutes walk from Vieux-Québec, Battlefield Park, and the Plains of Abraham public park, making it a great area for walking and sightseeing. Big hotels like the Hilton and Hôtel Château Laurier are located in the area, with the Changing of the Guard at La Citadelle always popular with tourists. Saint-Jean has a modern bohemian vibe that's rooted in history and tradition. This neighborhood connects to Haute Ville via the Rue Saint-Jean, and to Saint-Roch via stairways or an elevator. There are plenty of trendy restaurants and bars lining the streets of Saint-Jean, with other popular sights including J.A. Moisan - the oldest grocery store in North America, the Saint-Jean-Baptiste Church, and St. Matthew’s Church cemetery. This young and up-and-coming neighborhood is located in the northeast of the city, with the population here growing by more than 20,000 since 1988. Annual festivals in this area include the spring arts festival Salon de Mai and the international children's folklore festival Festival Folklorique des Enfants du Monde. Despite its young and family-friendly vibe, Beauport has a rich history that stretches back to the eighteenth century. This Quebec borough was recently created in 2009 from the former borough of Sainte-Foy–Sillery and part of the former borough of Laurentien. Home to the Université Laval and other notable educational institutions, this area attracts students and young families. From the first French-speaking University in North America through to the aquarium and beautiful parks, this neighborhood has so much to offer to young Quebec City residents. 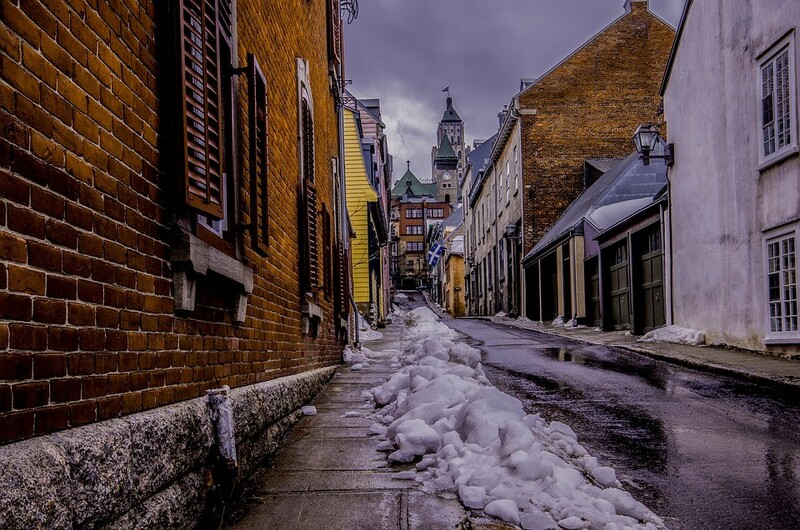 The “Little Champlain Quarter” is often said to be the oldest commercial district in North America. Quartier Petit Champlain is both its own neighborhood and part of Vieux-Québec, with residents here close to restaurants, art galleries, and tiny cobblestoned streets. If you're feeling brave, The Breakneck Stairs is the city’s oldest stairway, with its 59 steep steps built back in 1635. Limoilou is a large borough, with roughly 20 percent of the city's residents living here. Featuring some of the oldest architecture in Quebec City and the large Le Domaine de Maizerets park, this area attracts young families and established Quebec residents. In summer, visitors can hike the trails or visit the butterfly house. In winter, people can ice skate in the park or ski some of the walking tracks. Montcalm is a residential area that is bursting with personality and good vibes. This neighborhood features some great restaurants, bars, and galleries, with major attractions like the Plains of Abraham and Musée National des Beaux-Arts du Québec also found here. Avenue Cartier is the heart of the action, with side streets running from Salaberry Avenue to Belvedere Avenue housing quiet residential streets. This is an elevated neighborhood with fantastic views of Old Town and St. Lawrence River. If you're feeling brave enough, you can take a trip to Les Glissades de la Terrasse to experience the rush of zooming downhill in a toboggan at up to 60 mph. While the winds can be brutal on a cold winter's day, the amazing views and Fairmont Le Château Frontenac make this a great place to visit. Groupe Dallaire is the biggest and most active condo development firm in Quebec City. This company owns 160 million square feet of land across the city in a number of strategic locations, some of which is designated to condo projects. Founded more than 54 years ago, the Groupe Dallaire portfolio includes office, commercial, industrial, multipurpose, and residential buildings. Prominent condo projects by Groupe Dallaire include Altura, Faubourg du Moulin, and Pointe des Châtels just to name a few. Altura Urban Condos is not just another condo project, it's a magnificent contemporary sculpture that rises to the 28th floor. Promising elite construction and modern living, this project offers, comfort, and tranquility in the luxury Quebec City condominium. Sylcorp takes great pride in constructing buildings with a singular focus and superior attention to detail. While this company's inception in 2002 makes it relatively new on the scene, the executive team behind Sylcorp has closed more than $300 million of real estate transactions, and has over 20 years of experience in acquisitions and leasing. Condo developments by Sylcorp include Le St-Moritz, 5300 Molson St., Le Beaumont, and Le WM just to name a few. Le St-Moritz is the company's new project, with this carefully considered development focusing on community building and quality of life through a combination of modern design and amazing locations. Concept St-Laurent is involved in the construction of single-family homes and condo developments across Quebec City. They provide great customer service and competitive prices to Quebec residents who want to purchase tailor-made condos in and around the city. Concept St-Laurent always aims to meet their deadlines and provide a personalized level of support to their customers. Condo developments by Concept St-Laurent include Life Space Le18, The 25, Mont Cervin, and Living Space Beauport Family. Life Space Le18 is a unique development that offers a commercial ground floor, a LE LOUÉNOK microbrewery, and a range of local services adjacent to the condo. The unit size varies, and here we find units from two to four and a half bedrooms, which sleeps your entire family comfortably. Different color finishes for kitchen and bathroom countertops are available. This contemporary and upscale real estate project is located in Limoilou. Groupe CSB is involved with multiple developments across Quebec City, including urban land developments, apartments, condos, and commercial real estate projects. The CBS Group has been involved in the real estate business for more than 20 years, with condominium projects increasingly available to people who want to eliminate the hassle of maintaining a single-family home. Condo projects by the CBS Group are designed to enhance modern lifestyles with buildings that offer energy efficient design and environmental performance. Their Villas des Forts condominium project, that is family and kid friendly, is currently at Phase 1, with this design offering four levels plus a mezzanine for people who want to enjoy the wonders of urban Quebec living. This condo development company is committed to the development of unique and intelligent living spaces in Quebec City. GM Development has been in operation for over 20 years, in which time they've designed and created a number of commercial and residential developments in the downtown area and beyond. Two well-known condo projects by GM Development are Tandem Courtyard Condos and Heavenly. Tandem Courtyard provides a comfortable living environment in the heart of the St-Jean-Baptiste district. With amazing restaurants and shopping on the doorstep, this is a great option for people who want to enjoy the wonders of urban Quebec living. XO is a real estate development company that builds condos and other living spaces for the people of Quebec City. The team behind XO has decades of experience in every aspect of the real estate sector, from design and project management through to the implementation and construction of large residential projects. 235 St-Vallier is the current condo development available from XO, with this project pairing inspiring design and quality amenities with distinctive and original living concepts. 235 St-Vallier offers Quebec City residents a condo building with a strong urban philosophy and sense of environmental awareness. Le Groupe Maurice is a leading design and development firm who has been involved with senior living projects in Quebec City since 1998. This company aims to create warm and inviting living spaces that meet the lifestyle needs of older Quebec residents. Le Groupe Maurice develops senior condo projects with services, including Boréa, Caléo, Ékla, and Floréa. Boréa is located on 54th Avenue in Blainville, with this innovative residential complex for retirees allowing older residents to enjoy an active lifestyle while surrounded by nature. Nova Construction is a construction and real estate company located in Quebec City. Working in the city since 1984, this company has been involved with multiple residential homes, commercial buildings, and condo projects. Condo projects by Nova Construction include Le Charles-Felix and Le Dijon. Le Charles-Felix is a modern building offering 68 condominiums ranging from 742 to 2,500 square feet. Along with stylish individual Quebec City apartments, residents can also enjoy a fitness room and indoor parking along with numerous other features. The property market in Quebec City continues to be flat, with low population growth and strong housing supply levels keeping a lid on prices for the time being. The median sale price for a condo in Quebec City was $240,000 in the last quarter of 2017, with the median sale price for a single-level home being $267,000, and the median sale price for a two-story house being $355,000. The median price of condominiums decreased by 1 percent over the course of 2017. According to Marc Pinsonneault, a senior economist with the National Bank of Canada, “It’s been a buyer’s market since 2013... Especially in the condo segment.” Condo sales represented nearly a quarter of all activity in the wider Quebec City metropolitan area in 2017, with buyers attracted to the relatively low prices and large inventory on offer. Les Rivières and Sainte-Foy have seen the highest demand, with a 27 and 17 percent increase in sales respectively over the course of 2017. While condo overbuilding has created more choice than ever before, it has also led to a decline in the sale of existing condos, which have dropped by 1 to 2 percent in each of the last four years. This is bad news for existing property owners who are looking to sell, with 'days on market' in 2017 almost double what it was in 2011. There are some great opportunities out there for buyers, however, due to an oversupply of new condos and reduced demand for re-sale properties. Even though buyers are definitely in control of the Quebec City market at the moment, an increase in foreign activity at the top end of the market is starting to place more pressure on prices. While foreign buyers in Quebec City still account for a small proportion of the market compared to places like Vancouver and Toronto, at 1 percent in 2017 compared to 0.8 percent in 2008, this number is slowly growing. According to figures from the Ministry of Finance, American buyers represent 32 percent of all foreign transactions, followed by French buyers at 20 percent, and Chinese buyers at 16 percent. Quebec City's economy is expected to grow by 1.9 percent in 2018, with the low unemployment rate likely to hold below 4 percent. Non-residential real estate projects will contribute most heavily to this growth, including a $587 million three-year infrastructure plan developed in 2017. While overbuilding during the last few years has contributed to a decline in new residential builds, the rental market is still strong and the tourism sector is as active as ever. You can easily find apartments for rent as well as condos for rent all over Quebec City. According to data from Centris, condominium sales activity is already starting to increase in Quebec City, including a 6 percent increase in the fourth quarter of 2017 and a 5 percent increase over the year. Strong fundamentals and low condo prices provide a great opportunity for new buyers and clever investors who want to get their foot onto the property ladder before sales activity increases even more and prices start to rise. Condominiums are a popular option for Quebec City residents, with condo sales representing almost 25 percent of sales activity in 2017 across the Quebec City metropolitan area. While Quebec City might not have the hurried pace of Toronto or Montreal, many parts of the city still offer a great urban living experience. From the streets of Old Quebec through to the in-demand areas of Les Rivières and Sainte-Foy, high levels of condo development over recent years have provided people with lots of options. Whether you're looking for a condo for sale as a new place to call home or a clever investment, relatively low prices and high stock levels in Quebec City present a great opportunity for condo hunters. This growing segment of the market also presents its fair share of challenges, however, so let's take a look at some of the steps you should take before buying a condo in Quebec City. Before you dive into the deep end, you should determine if a condo is the best fit for you. Owning a condo is very different than owning a single-family residence, so it's important to do your homework. Contrary to popular opinion, a condo is a form of ownership and not a type of building or structure. Condominiums can be high-rise buildings, low-rise buildings, and even duplexes or triplexes. The fundamental difference with condos is that along with your condo apartment, you also own a share of the common assets and services of the building. While this means less maintenance for you, it also means you have to pay ongoing maintenance and association fees related to the amenities that are available to you. Like most things in life, it's important to take care of your finances from the outset. There's no point searching for a condo if you don't have a working budget, so start by looking into banks and lenders and compare what they have to offer. Mortgage pre-qualification is the first step, with banks likely to take a good hard look at your income, debt levels, and credit history. Pre-qualification is generally available in writing and comes with a guaranteed interest rate for a specified time period. Once you know how much money you have to play with, you can start organizing a team and researching specific developments. Buying a condo in Quebec City is very different than purchasing a single-family home. Even when you're sure that condo living is right for you, it's important to distinguish between the different types of condos for sale. New or pre-construction condos include all new developments, many of which are available for purchase before they have been completed. Re-sale condos include existing condo apartments that are sold on the private market. Re-sales are having a tough time in Quebec City at the moment due to the number of new units on the market, with clever buyers able to snap up some great deals. The third category is known as renovation condos, with these apartments often refurbished historic buildings or commercial spaces. It's important to find an experienced real estate agent who specializes in what you're looking for, along with a good lawyer and qualified accountant. What is your working budget? Where do you want to live? What type of condo are you looking for? How much can you afford in maintenance fees? Does it need to be pet friendly? Searching for the ideal condo takes time, energy, and commitment. Whether it's hours spent on the computer or days walking the streets, it's important to understand the market and know the city well before signing any contract. While a high-rise condo in the inner-city may be perfect for many, others will be much happier living a little further out if they can access parkland and recreational spaces. Along with preferred locations and access to amenities, it's also important to look at market forecasts and possible future needs. Condo development companies come in all shapes and sizes, from long-established businesses that deal with every aspect of development through to new companies that specialize in construction or sales. Different philosophies may come through in design and environmental decisions, so take your time and have a good look around before diving in. Along with experience, philosophy, and reputation, it's also important to analyze maintenance fee structures and how they are likely to impact your standard of living. Maintenance fees are an unavoidable part of condo living, with ongoing fees used to pay for the service of common assets, certain utilities, staff wages, insurance, and a contingency reserve fund. Fees can differ widely from building to building, so it's important to compare projects with regard to fee structures and potential fee increases. Maintenance fees depend on the size of the unit, too, as they are normally charged per sq ft of the apartment. Property taxes are an important revenue source for municipal governments across Canada. From water and garbage collection through to policing and fire protection, these taxes help to finance many of the services that residents enjoy on a daily basis. Municipal governments set property tax rates according to the type of property, the value of the property, and the tax rate in question. Depending on the jurisdiction, property types may include residential, multi-residential, commercial, and industrial properties. Property tax is one of the three main taxes paid by Canadian households, along with income tax and sales tax. Where property tax differs is that it's a tax on a specific asset rather than a financial flow. Property tax is based on the full value of the property, not the owner's equity. Tax rates are determined annually by the City's operating budget, which is adopted by City Council during December of the preceding the year in question. In Quebec City, property tax is connected to a single piece of property. Maintenance fees are a big part of condo living, with ongoing fees used to pay for the common assets and services of the building. Along with owning an individual apartment, condo owners are also responsible for a proportion of the building it's located in. While maintenance fee structures vary considerably from building to building, they normally include things like cleaning, maintenance, staff wages, insurance, and a contingency reserve fund. Some fee structures also include utilities such as water and electricity, which is one of the reasons why they can differ so much. Before buying a condo, it's important to research fees and compare costs based on the square footage of the unit and the amenities that are available to residents. While the size of the apartment has the most influence on fees, staff wages and common areas can also have a dramatic effect. For example, you are likely to incur much higher maintenance fees if your building has a pool, employs a concierge, or is old enough to need significant repairs. Smaller buildings are also likely to have higher maintenance fees than bigger buildings, because the same costs need to be shared among fewer people. Maintenance fees are calculated by the individual Condo Corporation in its annual operating and maintenance budget. Along with current fees, it's important to think about future fee increases, the age of the building, the possibility of future repairs, and the size of the contingency reserve fund. If you want to stay on top of planned fee increases and understand exactly where your money is going, it's important to attend the condo board's annual general meeting. Q. How French is Quebec City? A. At 94.6 percent, the vast majority of Quebec City residents are native French speakers. While Montreal has a much bigger population, and is the second-largest French-speaking city in the world after Paris, Quebec City is often referred to as the capital of French Canada. Q. What are the most popular festivals in Quebec City? A. Quebec City is famous for its vibrant Winter Carnival, its summer music festival, and its Saint-Jean-Baptiste Day celebrations. Other prominent festivals include the Festival d'Été de Québec, the New France Festival, and the Festival International de Jazz de Québec. Q. 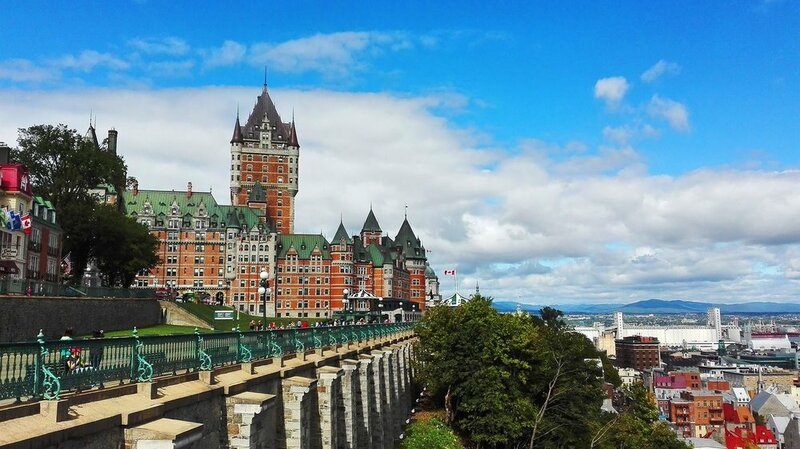 What are the biggest tourist attractions in Quebec City? A. Parc Aquarium du Québec is a major new attraction in Quebec City, opening in 2002 and overlooking the Saint Lawrence River. There are also a number of fantastic art galleries and museums across the city, including Citadelle of Quebec, Musée national des beaux-arts du Québec, and Musée de la civilization. Perhaps the biggest tourist attraction of them all, however, is Old Québec itself - a UNESCO world heritage site that feels more like Europe than North America. Q. What are the dominant industries in Quebec City? A. As the capital city of the province of Quebec, most of the jobs in the city are concentrated in public administration and defense. The provincial government is the largest employer, with the local hospital network, CHUQ, being the city's largest institutional employer. There is also a number of prominent private sectors, including services, commerce, transport, manufacturing, and tourism.